This article comes from our Newsletter which comes out 3-4 times per year. Sign up to receive in your inbox! Chris has been the technical lead and primary developer for the Scripture App Publishing Service. Last fall, they started working with two partners, Faith Comes By Hearing and International Mission Board, to plan an update to the service in order to 1) support multiple organizations and 2) customize the process of publishing apps for each organization. This would require a significant re-rewrite to a portion of the service. About that time, Chris’ organization applied to Every Tribe Every Nation (ETEN) for direct funding of certain projects including the Scripture App Publishing Service. A very generous grant was given by ETEN that has allowed them to sign a contract with DeveloperTown to design and develop the software that needs replaced. They didn’t have the staff to complete this work internally and this is a great opportunity to complete the work. Praise God for the resources and talents He has made available! 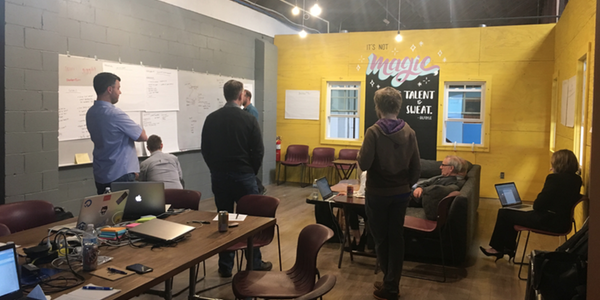 Discussions around a whiteboard during the initial design meetings at DeveloperTown in Indianapolis with people representing SIL International, Faith Comes By Hearing, Scripture Earth, and Kalaam Media in early April 2018.